Japanese Fish Collagen Peptides : Studies show that collagen peptides extracted from fish collagen and processed into nano peptide molecules have a superior bioavailability, absorbability and digestibility compared to other fish collagen products. Due to the nano small molecular weight and size, it is absorbed at a higher level through the intestinal barrier into the bloodstream and carried throughout the body, leading to more new collagen deposits in joint tissues, bones and skin. 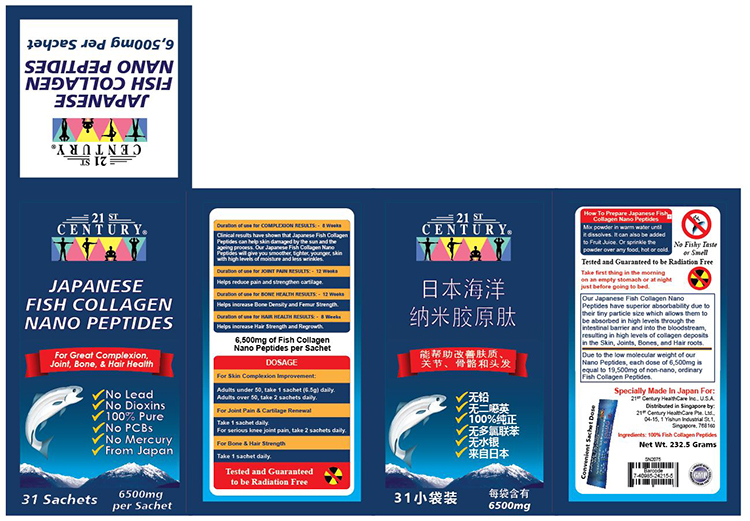 Our Japanese Fish Collagen Nano Peptides have the lowest molecular weight of all other Fish Collagen products in the market - it is under 1,000 Daltons Da) whereas all the rest are over 3,000 to 5000 Daltons (Da). So one dose of 6,500mg of ours is equal to 19,500mg to 30,000mg of other fish collagen peptides.The lower the weight the smaller it is and more absorbable into the body. Many companies even pass off ordinary cheap collagen powder as collagen peptides. Usually these are mail order companies who cannot be traced and checked for quality. Or companies with no known reputation. One sachet of 6,500mg is the daily dosage to provide skin rejuvenation and cartilage repair and strengthen bones and hair Each box has 31 sachets which is enough for 31 days. For just $1.87 a day, you will see your skin become younger with wrinkles reduced after 8 weeks.When you are young there is a lot of collagen in your body. As we get older, after age 20, the collagen in our body becomes less and less leading to wrinkles and joint pains and weak bones. So one dose a day will solve all these problems caused by our natural ageing process which we can do nothing about, can we? But we can try to look younger than our age and be as healthy as possible using modern science and its new developements, like this product. 21st Century's Fish Collagen Nano Peptides are from Japan and made to the highest specifications specially for 21st Century HealthCare USA. It is not a mass manufactured low quality product like almost all other fish collagen products in the market. We have kept the price low due to our company policy of QUALITY PRODUCTS AT EVERYDAY LOW PRICES. Equivalent quality fish collagen peptide products can cost up to $180 and not just S$58. Many companies are selling at very high prices - to pay for the celebrities who have been hired to promote their less refined collagen peptides products. And these products are not even from laboratory tested manufacturers like our Japanese manufacturer who incidentally supplies to the leading brands in Japan - and now to us. Unlike other Japanese brands we have not diluted it with Vitamin C and other cheap 'fillers' to keep our cost down. We test every batch in our labs in USA to ensure high quality. Most other brands do not even have an in house lab! So be smart. Take our Japanese Fish Collagen Nano Peptides and save money while being sure that this is the best there is in the world. Only this Japanese specialist sea food processing giant company has the expertise and resources to produce super refined less than 1,000 Da (dalton) fish collagen nano peptides which were made for 21st Century to 21st Century's high specifications. We could have ordered cheaper Fish Collagen peptides from other countries. But after scouring the world we zoomed in to the best producer with the highest quality in Japan. A producer who could guarantee quality and whose every batch is laboratory tested and certified. Adults under 50, take 1 sachet (6,500mg) daily. Take 1 sachet (6,500mg) daily. Clinical studies have shown that Collagen Peptides can help eliminate spots created by damage from UV rays. Our Collagen Peptides will lead to smoother skin with higher levels of moisture and a reduction of wrinkles. Proven to reduce pain and strengthen cartilage. Helps give healthier looking hair after 8 weeks. Take first thing in the morning, on an empty stomach or at night just before going to bed. As a drink, mix powder with a little warm water till it dissolves and drink it before or after meals. You can also mix it into fruit juice like orange juice or cranberry juice or any juice that you like. Or just sprinkle the powder on your porridge or noodle or any food. No fishy taste or smell due to super refining techniques used by our Japanese manufacturer.